In case you don’t have an AVR programmer but you do have an arduino, the arduino can be converted into an AVR flash programmer, meaning it can program bare AVR microcontroller chips. Say if you have an AVR chip and you want to program the chip, so that the program that you’ve written and compiled gets stored into the flash memory of the chip to be executed. The arduino, with some specific wiring, can act as this flash programmer. This way, you won’t need to spend extra dollars on an AVR flash programmer. ard to upload and run programs on Atmel AVR chips, it is all that surprising that it can function as an AVR programmer itself. In this case, it doesn’t actually execute the program. It just transfers the data from the computer to the AVR chip that you want to program. 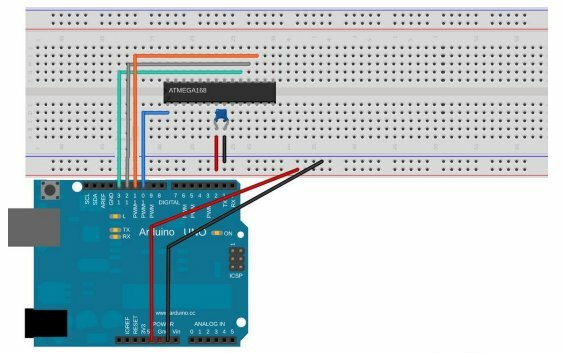 Using an arduino is especially easy, because one real advantage of the arduino is that the chip on it comes pre-flashed with a bootloader, which is code that enables teh chip to communicate with your computer over the serial line in order to flash program itself. 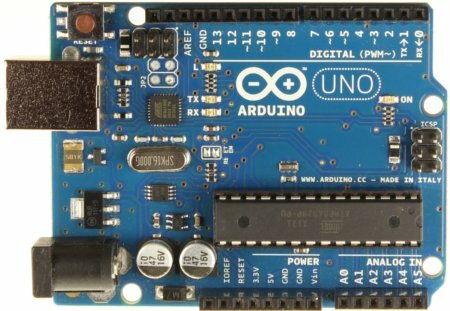 A second advantage is that an arduino comes with a built-in USB-to-serial converter, so you can just use the USB cable to establish connection with the computer. And using the arduino as a hardware programmer is pretty easy. With just 6 wires between the Arduino and the AVR chip, we give the AVR chip a source of power and a flash programmer that is just as good as any other type of AVR flash programmer. The first step toward using the arduino as a flash programmer is hooking up the necessary hardware of the arduino board to the AVR chip. Before we actually show the schematic, it would help tremendously to know the pinout of an Atmel AVR chip. Specifically here, we will look at the pinout of a very common AVR chip, the Atmega168. The Atmega328, also very popular, follows the same pinout. It’s just a chip that contains more memory. Knowing the pinout of the Atmega chip is very important, so that you can know which pins you are connecting to on the Atmega chip and why you are connecting there. Else, you will be connecting blindly to pins, not even knowing which pins they are. So, in total, these are the 6 connections that need to be made. The essential 6 connections are power, ground, RESET/PC6, SCK/PB5, MISO/PB4, and MOSI/PB3. We give power to the Atmega168 chip by the 5V terminal and GND terminal of the arduino. Pins 7 and 8 on the Atmega chip represent Vcc and GND. These are the pins we supply voltage to in order to give power to the Atmega168 chip. In between Vcc and GND, we have placed a 100nF (0.1µF) capacitor. This capacitor is simply to filter out any noise that may be on the DC power line, so that we can get a clean DC voltage signal. Once we have the power, we make the other 4 connections that are needed. Digital D10 pin of the arduino connects to pin 1, the RESET pin, of the Atmega168 chip. This is a very important connection. AVR microcontrollers are able to write into their own flash program memory space when you reset them. All of the Atmega series microcontrollers are set up so that when you reset them, they start listening for data on the SPI lines and with the right instructions can program themselves. A flash programmer works by grounding the RESET line, which halts the CPU and signals the AVR to start listening on the SPI bus. The programming instructions (of the program to be executed) can then be transmitted over the SPI bus. After each instruction or section of code, the AVR writes the received data to flash memory. Some of the tiny AVR chips flash the data to program memory after every few bytes, which can be slow. Larger and newer chips store the incoming data in a temporary page memory and then write it all at once, which is much faster. After the programming is complete, the data from the flash memory can be read back out of the AVR’s flash memory to verify that it’s correct. AVRDUDE, which we will introduce later, can do this. The other 3 connections are Arduino pin D11 connecting to Pin 17 on the Atmega168 chip. D12 connecting to pin 18. And D13 connecting to Pin 19. Once we have these connections, this completes the arduino as a flash programmer. With the compiled software code, we can use this Arduino flash programmer to transmit the compiled program to the AVR microcontroller’s flash memory to be stored. With the program stored in flash memory, it can be executed by the AVR microcontroller. We can attach status LEDs to the above Arduino flash programmer, so that we can physically see the status of what is going on when we run a program.